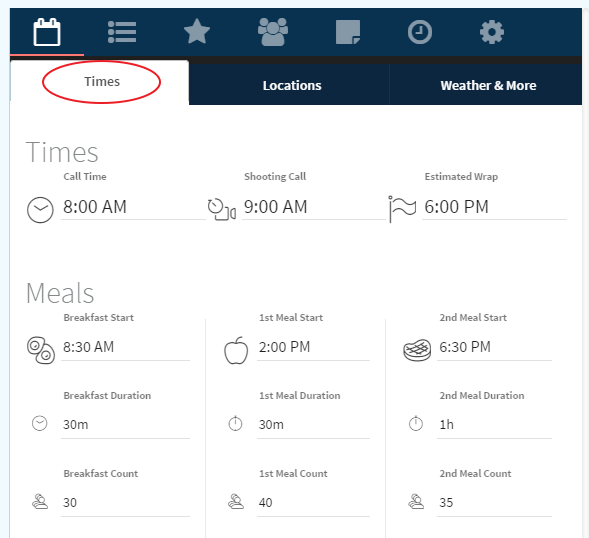 The “Times” Section allows you to set all of your times for the day. This includes your call time, shooting call time, and estimated wrap time. It’s also the place where you will schedule all of your meal breaks. 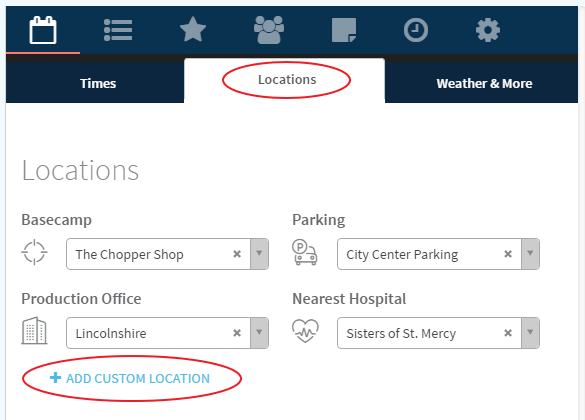 The “Locations” Section allows you to set all of your basic locations for that day including basecamp, parking, the production office, and the nearest Hospital. You can also add custom locations (example: a second parking option) as needed. 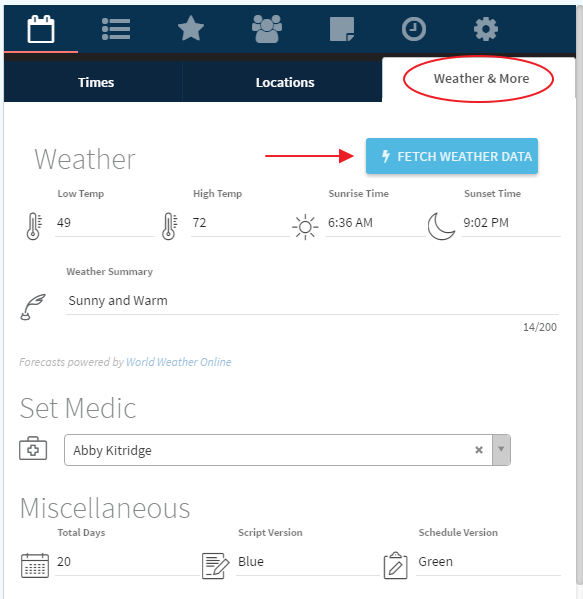 The “Weather & More” Section Is where you can fetch the weather forecast, specify the set medic, set the total number of shooting days, and list the script and schedule versions. This section is where you specify all of the scenes listed on that day’s call sheet. You can also include shooting times or durations for each scene if you choose, and insert company moves or banner breaks as needed. You can also add a note to any scene as needed by clicking the talking bubble associated with that scene. The “Today’s Schedule” section allows you to specify the scenes being shot that day. 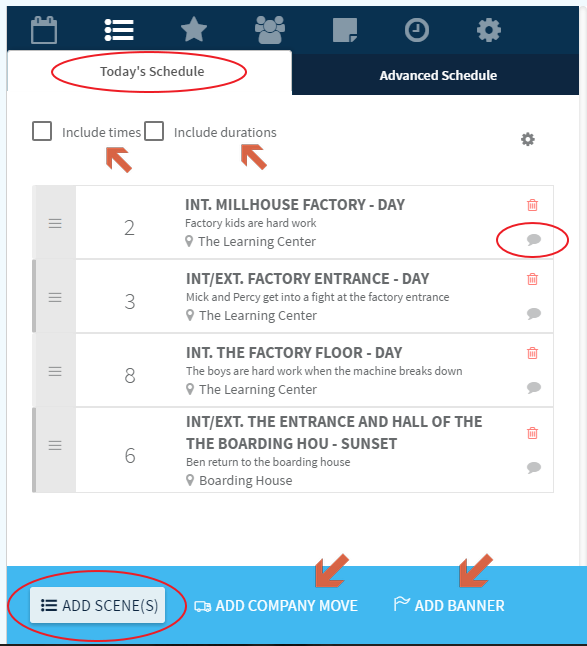 Click the “Add Scene” button to search scenes by name or number and to add them to the schedule. 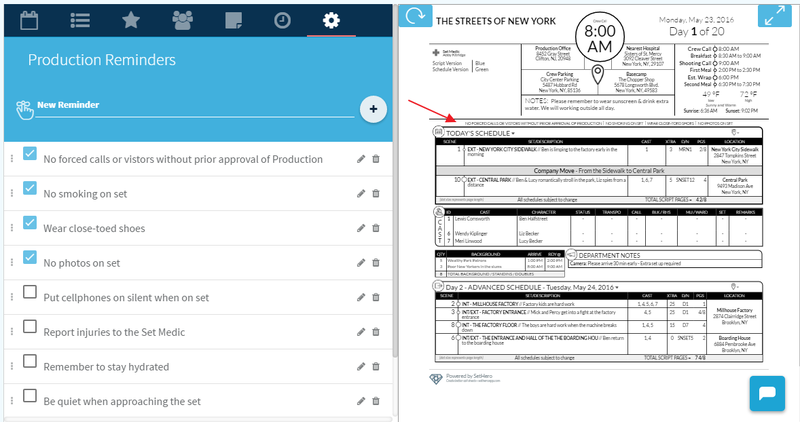 The “Advanced Schedule” section allows you to select the scenes that will be on the next day’s call sheet. Once you specify those scenes in the Advanced Schedule they will appear in the “Today’s Schedule” section on the next day’s call sheet. If you don’t want or need to display an advanced schedule on your call sheet you can toggle it off at the top of the “Advanced Schedule” section. This section allows you to specify all of the schedule details for each cast member. Including their working day, all of their times, and any other remarks you might have for that cast member. This section allows you specify all of the extras and standins needed for that specific day. It allows you to describe them and list their schedule times. You can also list multiple types/groups of extras for each day. This section is where all special notes are entered. There are note sections on the front and back of the call sheet and a “Quote of the Day” section. If you don’t want to display a “Quote of the Day” you can toggle it off. 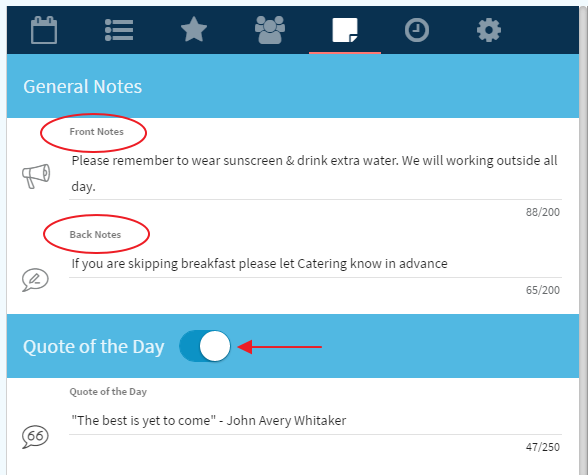 This is also where you can enter specific department notes. These notes appear on the front of the call sheet in the “Department Notes” section. This section is where you can specify specific crew call times. The general crew call time will be listed at the top, but you can specify department pre-calls and individual pre-calls as needed. These call times appear on the back of the call sheet. To specify a pre-call click the desired “Add Precall” button. Pre-calls are defined in minute increments off of the general crew call time. For example, if the camera team needs to arrive at 7:30am instead of 8:00am you would list their pre-call as 30 minutes early. If someone is off or on-call that day you can switch the pre-call box to a text box so you can enter the correct notation. 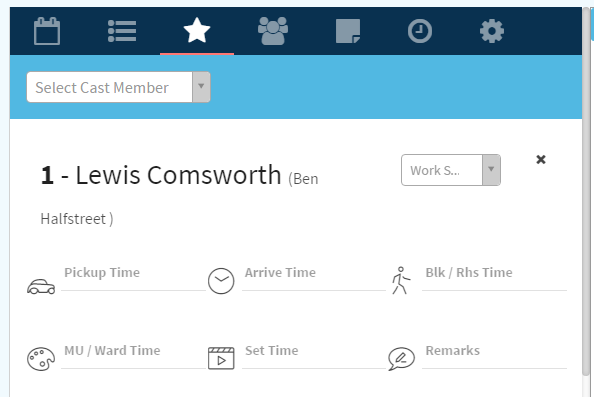 Key Crew Members and Contacts - To make someone a key crew member select the star icon next to their name in the Crew Call Times section. This will add them to the top left section on the front side of the call sheet (generally for directors, producers, and other leadership). To make someone a key contact select the phone icon next to their name. This will list them in the Key Contacts section on the bottom right side on the back of the call sheet. These selections will copy forward to future call sheets.